The Apron Gal: Cream Cheese Brownies + Giveaway! You know I love having a food blog. And I love cooking. And I love baking. But you know what? I'm busy. Really busy. Yes, I know, everyone is busy! But some days I don't get home until 10pm from work, classes, church, or just plain having fun! But that means that is harder and harder for me to cook and bake as much as I like. So part of what I have discovered is learning to accept my limitations. I don't know if I will ever be a person that makes cupcakes or brownies from scratch when they taste so darn good from a box. Yes, occasionally, but when it's 8pm and you are having 8 people over for important things, like watching The Bachelor, I mean, I just needed to throw something together! So I found the perfect solution! Take a brownie mix and spice it up. So I added a cream cheese layer and it was perfect. Everyone loved them. I felt like I baked something but didn't have to spend too long figuring it out. So I hope you still love me, even if I continue to make "semi-homemade" food for you. I promise to have real recipes too! But back to the recipe. This recipe spices up a boxed brownie mix with a simple cream cheese mixture. I also made these in my new Chinet bakeware! If you haven't seen these, they are one time use disposable cooking/baking pans that come with a lid. It was perfect for a night when the less dishes I had, the better. You can even stick them right in the oven. My brownies turned out perfectly in them and with the few leftovers I had, I just stuck the lid right on. If you don't believe me, enter for a chance to win an assortment of these for yourself! (similar to those below) They are perfect for bringing treats to work or dropping off dinner to friends. Especially so you don't have to track down your real bakeware afterwards! All you have to do to enter is like The Apron Gal on Facebook but you can get additional entries through Twitter as well! Giveaway open to US residents only. Giveaway begins on Wednesday February 13 and ends Wednesday February 20th. 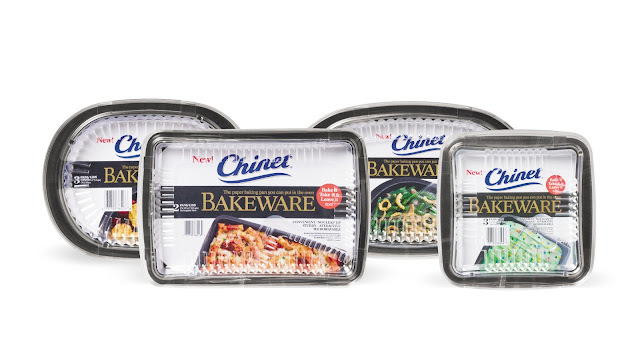 Chinet will send the winner their bakeware! Preheat oven to 350 degrees. Make brownies as directed on package and spread into a greased 9 by 13 pan. Combine remaining ingredients until smooth. Drop cream cheese mixture by tablespoons full onto the brownies. Using a knife, stir the cream cheese mixture into the brownies until you achieve your desired "marbled" look. Bake for 35-40 minutes or until cream cheese top is lightly browned.